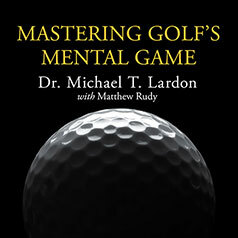 Dr. Michael T. Lardon reveals how golfers can improve their scores by changing their mental approach to the game. To be a golfer is to tinker—with everything from equipment to grip to swing. But one thing most players don't give enough attention to is the mental game. Psychologists aren't a new phenomenon in golf, but Dr. Michael Lardon is a different breed of performance coach. Instead of sending his players into a losing battle against emotion, indecision, and fear on the golf course, he shows them how to organize their thoughts and use them for maximum performance. His step-by-step Pre-Shot Pyramid provides any player with the ideal blueprint for shot setup, and his revolutionary Mental Scorecard will give you the tools to accurately measure what you really do on the golf course. You will learn the same techniques that Dr. Lardon shares with Phil Mickelson and dozens of other tour players, including the tools that helped Mickelson right himself after the 2012 U.S. Open to win the British Open a month later with a historic final round. Mastering Golf's Mental Game will change the way you think about golf, and is a must-listen for any player serious about shooting better scores and getting more enjoyment out of the game. You can’t view any supplemental PDF materials before you buy Mastering Golf's Mental Game. If you purchased it elsewhere, please enter the access code provided in the beginning of the audio to view the supplemental material. All access codes should be entered in lowercase letters. PDF software is required to view the supplemental PDF.